It’s a rather impressive, if controversial, resume for a teenager: blamed for the election of Donald Trump, increased divorce rates, rising syphilis cases, and the advent of fake news. Facebook turned 14 on February 4, 2018. And the controversies continue unabated. But there’s one aspect of Facebook that should not be lost in all the noise: the extraordinary change it has brought about in how we connect, communicate, consume and share content – in the classroom, as well as in other spaces. Putting the words “Facebook” and “learning” together may seem like an oxymoron. But my research has delved into the role Facebook has played in shaping how the new generation consumes and shares content. Understanding this is pivotal to understanding how we should be using technology to teach in the digital age. Quite simply, Facebook has changed the way that children learn. That’s what I’ve discovered through my research, which used a cyber-ethnography approach to try and determine how students are learning in our modern digital age. This involved essentially “living” with students while they connected, communicated, and learned in a Facebook space. I spent an entire semester watching and interacting with students at the University of KwaZulu-Natal in South Africa as they used a Facebook page as their primary learning portal. The students were given admin access to the space. This meant they could determine how the space was used: who had access to it, how it was designed, what was posted on the page, and even the level of anonymity of their posts. This provided me with an opportunity to watch the students learn, unfettered from traditional learning constraints. However, it would take a while for the students to fully explore their learning within this new space. Initially the students would often attempt to defer to me and my guidance. Only after I repeatedly refused to control their learning experience did they begin to behave in a self-oraganising way and allow me to observe their “natural” learning patterns. The research revealed that Facebook provided students with a series of learning affordances. Affordances are “can do” oppportunies, some intentional and others unintentional, that technology spaces provide. In this instance the research revealed that the affordances at play were accessibility, connection, communication, control and construction. These affordances provide valuable insights into how students learn in digital spaces. Once I understood this, I could turn my attention to the key need: developing ways of teaching, called pedagogies, that are appropriate for the digital age. Currently the focus on technology – the what, has distracted us from pedagogy: the how. Without understanding how best to apply these new technologies’ affordances, educators will not be able to effectively impact teaching in the modern classroom. I can tell people they need to teach better. But if I don’t give them things that are easy for them to implement, they won’t do it. That’s where the Activated Classroom Teaching (ACT) model comes in. I developed this model in a bid to create a taxonomy of teaching and learning for 21st century classrooms. A taxonomy is an ordered arrangement of items. One of the most famous of these is Bloom’s taxonomy of thinking. The ACT model attempts to provide a taxonomy of digital-age teaching approaches. The ACT model consists of five digital-age pedagogies that seek to maximise the affordances of technology, modern students’ approaches to learning and the development of key 21st century skills such as creativity, problem solving, curiosity, critical thinking, etc. The focus is a shift from passive ways of teaching (consumption) to active approaches (curation, conversation, correction, creation and chaos). This aligns with research that shows children are spending more than half their online time actively engaging: creating content, getting involved in “interactive consumption” and communicating. Ignoring the tectonic shifts taking place in our classrooms is not the solution. Simply dropping technology into our classrooms is not the solution. Simply training teachers to use computers is not the solution. As British author and education expert Sir Ken Robinson has said, we need a paradigm shift, but it’s more than that - we need a pedagogy shift. The Collins English Dictionary unveiled a thoroughly modern concept as its word of the year for 2015: binge watching. It usually refers to consuming endless hours of movies or series on Netflix, one after the other. But binge watching is about the more fundamental issue of the world’s obsession with content consumption. A recent report on media use reveals that teens are now spending more hours consuming media than sleeping. The average American teenager is spending about nine hours a day on entertainment media alone. Is this really the huge problem it’s made out to be? Partly, yes - because while they are engaging with a lot of information during those nine hours, they are creating barely any content of their own in this time. This passivity is being replicated in classrooms. What will it take to replace these with engaged, active classrooms? There may be times when this is true. But today’s devices are not like the single function radios and televisions their parents grew up with. In the past if a child was spending lots of time in front of the TV it was obvious they were doing only one thing - watching TV. Modern devices allow for a wide range of activities from consumption to conversation to creation. Even sitting in front of a TV a child today could be doing anything from having a conversation, playing a game, watching a movie or creating a world in Minecraft. The problem arises when children aren’t doing any of these things during their nine hours of entertainment media. The research shows that on average, kids are spending about 40% of this time on “passive consumption” compared with just 3% of their time on content creation. It would be easy to dismiss this if it only happened at home, in children’s own time. But there ought to be concern when this trend is picked up and implemented in classrooms. This is unfortunately exactly what’s happening. Schools are making a headlong rush to digitise the classroom. The media is awash with stories about tablets being rolled out, smartboards being installed or YouTubed classrooms. All of these technologies have great potential - yet at their core they are all about consumption. They do little to move the learner from a passive consumer to someone who is actively engaged. The result is fuelling our students' “binge watching”, passive consumption diet. It is also leading to more and more studies suggesting that technology is not working in the classroom. However, maybe it’s not the technology that isn’t working, but the way we’re using it. There is no doubt that our education system needs a revolution. That doesn’t mean doing what we have always done and just silicon coating it. A revolution needs new approaches to teaching and learning. It must be based on activity, not passivity. What is exciting is that the seeds for an activated classroom approach are already found in children’s current media habits. All that teachers and parents need to do is harness them. Another way to look at Common Sense Media’s research is in terms of the active things children are doing with media. While they may be spending 40% of their time on passive consumption, they are spending 3% of their time creating content, 25% on “interactive consumption” and 26% communicating. That means they’re spending more than half their time actively engaging with media. It is these activities that hold promise for the future of classrooms. Teachers must encourage a move away from passive content consumption towards active engagement with media in their classrooms. For example, rather than providing students with prepackaged course content, students can source and curate their own content using tools like Flipboard. Rather than passively watching videos, students can be actively involved in creating their own videos about the content. Rather than simply reading content through books or ebooks, students can rather engage in conversations around the content, with tools like Google Hangouts. While the binge watching trend may signal a worrying focus on consumption, research shows that active teaching and learning approaches are good for students. The future of our classrooms relies on teachers harnessing this energy, combining it with the benefits of technology - then activating learning in the classroom. By moving students from passive readers and hearers to active curators and creators, teachers can significantly impact both students' enthusiasm in the classroom and how much they learn. “Video killed the radio star,” laments the catchy lyrics of the old 80s song by the Buggles. This trend, of one technology killing another has continued, as streaming media killed videos, smartphones killed cameras, and tablets killed PCs. But once more we have been surprised, this time by the technology taking over classrooms. Schools are faced with a difficult decision - what technology would work best in the classroom? Laptops, tablets, smartphones, or something else? And, does it really matter? It turns out, contrary to what most would had predicted, the technology most used in the classroom is not what was expected, and this may have a huge impact on how our students learn. There's little debate now. Technology will be used in our classrooms. Even schools who are resisting the move will inevitably be swept along by the biggest change to impact education since the invention of the printing press. Most schools have narrowed down their options to two contenders - iPads/tablets or laptops? However it’s still difficult for schools to decide, especially when multi-billion dollar corporations woo them with impressive presentations as they compete for a market predicted to be worth $50 billion in 2016. However, maybe its not the device that schools should be preoccupied with, but rather how students use these devices. One way to look at how students use technology, and hence its potential impact on education, is called the “lean back” vs “lean forward” approach. This model, originally developed by Jakob Nielsen in 2008, considers the position we adopt when we engage with technology and the resultant impact this has on how we use technology, in other words our engagement style. For example, when I grab a laptop I naturally want to sit at a desk. This is referred to as lean forward device usage. By contrast when I use my iPhone or iPad I am more likely to use it sitting on a chair. This is called lean back device usage. A lean forward device, like a laptop, typically sees the user more active but with shorter attention spans as they switch tasks and skim content. They are designed to be used with a mouse and keyboard, more often seated at a desk. The benefit of lean forward devices are that they lead to greater activity, with increased brain activity associated with skim reading, searching, and content creation. By contrast a lean back device, like an iPad, sees the user more passive, but often with longer attention spans as they consume content. They are designed to be navigated with the flick of a thumb, while sitting comfortably on a couch. The benefit of lean back devices are that they lead to greater reading, and consuming of content, especially during “dead time”, such as while commuting or waiting (Whirlpool). When it comes to learning, lean forward and lean back approaches have been around for centuries. Lean Forward 1.0 - The first era, where learning was through conversation, known as Socratic dialogue, was a lean forward era. Lean Back 1.0 - The second era, arising after the invention of the printing press, was a lean back era, as learning increasingly was from books. Lean Forward 2.0 - However with the development of computers and more specifically the Web, we witnessed a return to lean forward once again. However, while elements of Lean Forward 1.0 and 2.0, and Lean Back 1.0 and 2.0 are the same , there are also elements that technology has introduced that are different. One of these is the impact on attention spans. For example, while Lean Back devices, such as TVs, are considered to have longer attention spans, the newer instantiation of smartphones and tablets has resulted in what is called “second screen” syndrome, where users simultaneously use their smartphones or tablets while watching TV. While second screen usage allows for users to engage with others about the content they are seeing, from a learning perspective this is resulting in shorter attention spans and increased cognitive load. So, while a useful model, Nielsen’s model predates the rise of smartphones and tablets, and as such doesn't consider other potentially important aspects that need to be considered, especially when it comes to education. Schools are trying to select a technology that will best enable effective teaching and learning in the classroom. Craig Will, argued that its no longer as simple as lean back and lean forward, and proposed a Mind:Engagement model. In this model he maps activity and absorption. The middle area is dominated by consumption, while the upper right quadrant, which would be considered the goal of educators - high activity and high absorption, is where students are using their devices for search, curation and communication, in other words activity. Gigaom Research, referring to marketers, suggests they “direct their advertising dollars to the upper right quadrant of the Engagement Style grid.” Educators should be doing likewise. It’s not what device should be used in the classroom that educators should be concerned with, but rather how the device is used in the classroom. Current approaches are failing because schools are simply attempting to replicate old consumption based approaches with new technology devices. And so blackboards have become smartboards, books have become ebooks, and teachers have become YouTube videos. Approaches grounded in consumption are simply receiving a new silicon coating. What is needed are approaches that encourage active engagement in the classroom, not passive content consumption. Lean back devices, such as tablets encourage more passive content consumption, while lean forward devices tend to encourage more active content creation. However, despite this, as Will's model points out, what is more important is how the device is used. The rapid rise in tablets has seen reports predicting that tablets will take over the classroom, thereby making it an easy decision for many schools to make. However once more analysts have been “shocked”. A recent report has now revealed that Google’s Chromebook makes up half of US classroom devices. Unlike laptops, Chromebooks (aka Netbooks) are lightweight laptops that have little on-board storage, with most applications and data residing on the web. Is this a shift arising from the failure of iPads that was widely reported in the media over the past two years? Is this a shift that signals a move by schools' from consumption-based approaches to more activated classrooms? Whatever the reasons for this shift, it seems Apple has already noticed as indicated by their recent entry of the iPad Pro into the market. This new device, which combines a larger screen size plus an optional keyboard and pen, is clearly targetted and not only content consumption but also at content production - everything from the middle to the top-right of the Mind:Engagement model. And according to early reports, its being suggested that the “shocking” swing towards Chromebooks in the classroom is already being eroded, as once more we witness another shift. “Forget the device. Focus on web-based applications that best meet the needs of your students and teachers...more schools will officially embrace what has already been happening under the radar for years: BYOD (Bring Your Own Device). Students will bring in all kinds of technology ranging from smartphones to laptops.” (HuffingtonPost). I would add, when it comes to Education Technology, focus on the education, not the technology, focus on training teachers not choosing devices. It's when we consider how we use technology more than what technology we use that our schools will have the best chance at transforming the classroom. The 2015 Word of the Year - Is this what’s wrong with schools? Recently the Collins English Dictionary selected the 2015 word of the year. The word was “binge watching” a word that reflects our drastically changing lifestyles. It basically means "to watch a large number of television programmes (especially all the shows from one series) in succession.” Lexicographers noticed that its usage was up 200% on 2014, hence awarding it the “word of the year” title. Binge watching may be exactly what’s wrong with education. Binge watching is not just about consuming endless hours of Netflix movies one after another, it's about a more fundamental issue - our obsession with content consumption. It’s an obsession that extends beyond our living-rooms and into the very hallowed sanctums of our classrooms. It’s an obsession fuelled by student habits and misguided teachers. It’s an obsession that is resulting in what might be termed “binge watching classrooms”. ​There are many exciting opportunities for us to use technology in our classrooms, however we are increasingly seeing reports that technology is not improving learning. What’s going wrong? Is it technology that is at fault or is it how we are using technology that is the problem? I believe part of the answer to this important question may be found in the 2015 word of the year - binge watching. 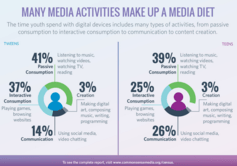 Common Sense Media’s recent report on media use by tweens and teens reveals that teens are now spending more hours consuming media than sleeping! The average American teen is spending about nine hours a day on entertainment media alone. However we must be careful of sensationalism that paints all media usage with a single brushstroke. All too often, when seeing children on their devices, parents respond with, “You’re wasting your time”. Yet, while there may be times when this is true, these devices are not like the single function devices that parents grew up with. In the past if a child was spending lots of time in front of the TV it was obvious they were doing only one thing - watching TV. However modern devices allow for a wide range of activities from consumption to conversation to creation. Even sitting in front of a TV a child today could be doing anything from having a conversation, playing a game, watching a movie or creating a world in Minecraft. So what are children doing with this 9 hours of their day? In support of the word of the year, more time is being spent on “Passive Consumption” than on any of single activity. 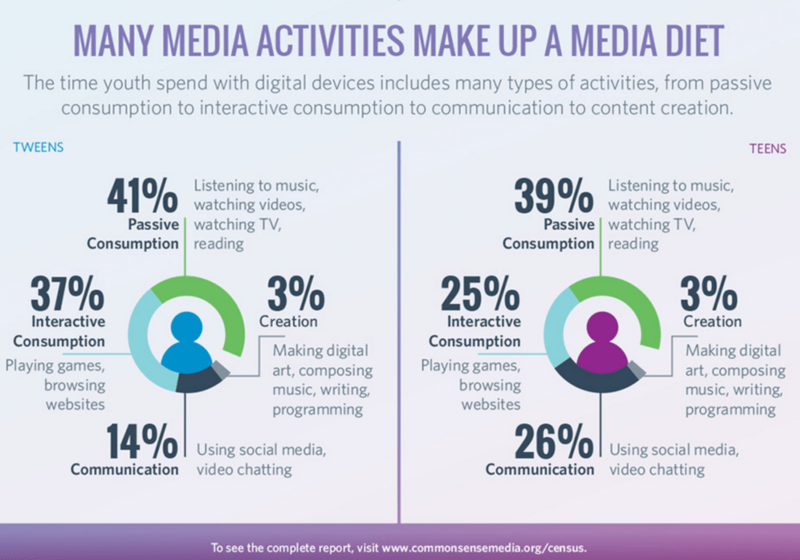 As the chart below shows, on average children are spending about 40% of their media time on “passive consumption” as compared to only 3% of their time on content creation. If this was all that was happening it might be easy to dismiss this as, “well it’s their time, let them do what they want.” However it's when this trend is picked up by teachers and implemented in classrooms that we have cause for concern, and that is exactly what we are seeing. Schools are making a headlong rush to digitize the classroom, yet this mostly implies digital consumption. The media is awash with stories about tablets being rolled out or smartboards being installed or YouTubed classrooms. All of these technologies have great potential, yet at their core they are all about consumption. They do little to move the learner from a passive consumer to an active engager. Reading ebooks on a tablet, or watching YouTube videos, while digital, is all about content consumption. Yet this is where many schools are spending their energy and resources. The result is fuelling our students “binge watching”, passive consumption diet, and resulting in more and more studies suggesting that technology is not working in the classroom. However, maybe it’s not the technology that is not working, but our use of the technology. There is no doubt that our education system needs a revolution - but a revolution is not doing what we have always done and just silicon coating it. A revolution, with revolutionary devices that we are now equipped with, needs new approaches to teaching and learning. One based not on passivity but activity. ​What is exciting is that the seeds for an activated classroom approach are already found in our children’s current media habits - all we need to do is harness them. Common Sense Media’s research shows that while children are only spending 3% of their time creating content, they are nonetheless choosing to spend some of their “down time” actively creating. In addition to this teens are also spending 25% of their time in “interactive consumption” and 26% communicating. Relooking at teens and tweens use of media we see that they both spend about 55% of their time on active online tasks. It is these activities that hold promise for the future of our classrooms. With more than than half children's time spent on active media engagement we need our teachers to encourage this activated style of learning in their classrooms. Where teaching and learning is not about consuming prepackaged content but engaging in active content curation. Where teaching and learning is not about passive content consumption but exciting opportunities for conversation around content. Where teaching and learning is not about watching recorded video lesson but learning through creating their own videos. This is the call to an activated classroom. If we are to escape the portend of 2015’s word of the year, the Binge Watching Classroom, we will need to, as teachers, step forward and become education activists!